Arlington, Va. - December 5, 2014 - PBS Distribution announced today it is releasing The Manners of Downton Abbey on DVD and Blu-ray January 6, 2015. Hovering just off camera on the set of "Downton Abbey" is the man who watches the actors' every move. The director? No, it's the historical advisor, Alastair Bruce, guaranteeing that the behavior above stairs and below stairs is true to the period of 1900s Britain. A treat for "Downton Abbey" fans or anyone who loves history, this program goes behind the scenes during the filming of "Downton Abbey Season 5" with Bruce to explore the elaborate code of conduct that governed British life. 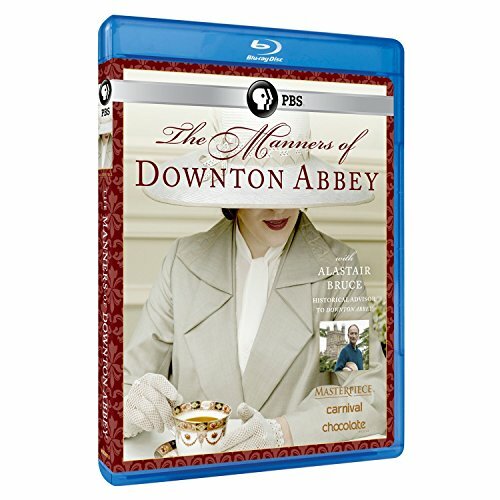 The Manners of Downton Abbey DVD SRP is $24.99 and the Blu-ray SRP is $29.99. The run time is approximately 60 minutes. This program will also be available for digital download. The Manners of Downton Abbey is a Carnival Films, Chocolate Media, and MASTERPIECE Co-Production. Funding for this MASTERPIECE is provided in part by Viking River Cruises and Ralph Lauren Corporation. Bruce, who holds the prestigious Order of the British Empire, is an expert on royal ceremony and custom, and has been the on set advisor to cast and crew since season 1. Among his responsibilities is to consult with the actors on how to speak, stand, sit, eat, drink, dress, and keep a stiff upper lip. With exacting precision, Bruce explains the intricacies of correct manners and behavior. "It's so difficult to take people back in time to when rules were so different," Bruce says. "The manners of Downton are not just about how to address a Duchess...it's much more important than that. It's key to how these people lived and exactly what they believe in...their manners held the old order in place when everything else seemed to be falling apart." The Manners of Downton Abbey , interviews with leading cast members such as Hugh Bonneville, Michelle Dockery, Laura Carmichael, Elizabeth McGovern, Brendan Coyle, Joanne Froggatt, and Lily James add perspective about the demanding norms that rule their characters' lives. The program includes many memorable moments from the series, along with comments from the actors about how key scenes were filmed. For example, Hugh Bonneville, who plays Robert, Earl of Grantham, recounts that in one emotional scene during season 3, he felt the story called for him to embrace Matthew Crawley (played by Dan Stevens). "But Alastair said, 'Don't be ridiculous! You might just shake his hand - just.'" Michelle Dockery, who plays Lady Mary, says, "Alastair is known on set as 'The Oracle' because he knows everything!" She adds, "I've sometimes said to Alastair, 'Can I lean back in my chair just a little bit,' and he said, 'Absolutely not - never in front of your grandmother!'" On the subject of ladies' proper attire, Laura Carmichael, who plays Lady Edith, points out a crucial detail from season 4 that probably escaped many viewers' notice. "When Edith goes to have dinner at (Michael) Gregson's flat, she's not wearing gloves, which was very shocking. She was practically naked!" The servants also had their own rigid protocol. For example, Brendan Coyle, who plays Mr. Bates, helps viewers read between the lines of a powerful scene in season 1, when he implores Lord Grantham to keep him on as valet. Master-servant protocol requires that Bates frame his request in the subtlest possible language - which Lord Grantham well understands. The Manners of Downton Abbey is divided into five enlightening sections -How to Eat, How to Marry, How to Behave, How to Dress, and How to Make Money -with many scenes from the series of aristocrats in their majestic surroundings. Not one to be left out of the pageantry, Bruce has had a cameo role in every season of "Downton Abbey." The Manners of Downton Abbey , watch for him in a scene from season 4, when Lady Rose (Lily James) is presented to the King and Queen at her presentation at court. Appropriately, Bruce appears as the Lord Chamberlain, the master of ceremonies at this most extravagant of court events, announcing each perfectly appointed debutante. The Manners of Downton Abbey is a Carnival Films, Chocolate Media and MASTERPIECE Co-Production. The host is Alastair Bruce. The Executive Producers are Alan Brown and Susanne Simpson. It is produced and directed by Louise Wardle. Rebecca Eaton is Executive Producer for MASTERPIECE. Gareth Neame is Executive Producer for Carnival Films. The Executive Producer for Chocolate Media is Alan Brown.